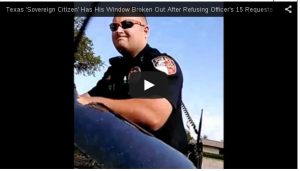 Officer in Addison, TX, stopping a “sovereign citizen” wackjob for speeding. This video (via National Memo, SPLC, and the Houston Chronicle) of a “sovereign citizen” trying to talk his way out of a speeding ticket is a great example of how “white privilege” works. This officer, in Addison, TX (part of Dallas County), humors the driver for about four minutes. Fed up with the moron, he calls for backup. When another officer arrives on the scene, he breaks the driver’s side window out, unlocks the car, removes the driver, and arrests him. The articles describing the incident commend the officer for not putting up with this guy’s stupidity, but would he have given a black or brown man the courtesy of those four minutes? On a related note, great article via HuffPo on the combination of police brutality and sexual harassment black women face from cops.